If you're a regular reader of From the Front Row, then you probably know that I occasionally like to post the outrageous opinions of right-wing Christian loony, Ted Baehr, a self appointed "film critic" and moral crusader for MovieGuide and the Christian Film & TV Commission. 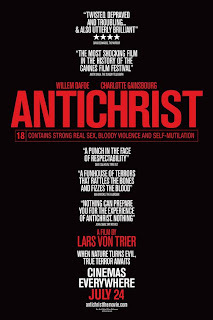 He has outdone himself in his moral outrage over Lars Von Trier's Antichrist (IFC, 10.23 - click here to read my review. ), starting a petition titled HELP STOP ANTICHRIST, which plans to lobby the MPAA to slap the film with an NC-17. Which it would fully deserve, of course, if it were to be rated. The problem is that Baehr, in typical Baehr fashion, did not do his homework or think his little crusade through. IFC is not a member of the MPAA, therefore they do not submit their films for ratings. Baehr can petition and bellow all he wants, but the MPAA can't do a damn thing about Antichrist. This movie is an evil ode to the forces of Satan. There is no doubt that it is trying to expose that evil exists, even in our rational world, but it does so in a very cruel and pornographic way. If the world had standards, this movie would be Triple X and banned. As it is, we are issuing our strongest warning not to see it, and to complain to the MPAA for allowing a movie like this to come to theaters near you. It's all ridiculous, of course. And one wonders how people like Baehr function in the real world when they can't even get the facts of their rants straight. Sorry, Ted. You're barking up the wrong tree. So go right ahead, keep petitioning the MPAA and protesting Antichrist, it's the best publicity IFC could possibly dream of. On "Where the Wild Things Are"
On "Capitalism: A Love Story"
Review: "The Yes Men Fix the World"